We ran a piece on the project back in 2012. The developer put in a lot of features and amenities into those units. It's really too bad that the situation has turned out the way it did, and I certainly hope this is not a sign of things to come. Yes, it will be, with only 14 sold. Presumably any buyers can backout of the deal. I think they've already taken possession. No backing out now. Condos in Langford were speculative IMO.... Sorry all but I grew up there. Condos are a towny thing where you walk. Yeah I can't imagine buying a condo in langford, it's like the worst of both worlds. Uh oh. I didn't realized it was finished. Perhaps it will be a repeat of the Fairfield Rise. Does anyone know what is going on there? The link to their Condo price list is down. I took a walk around there today. About 5 cars in the parking lot. Except for 1 retail unit that is occupied the units are completely bare, the floors are still gravel. And I saw this sign on the door. It is from " Hayes McNeill- Receiver- Manager". Is this project Kaput? Again? The project entered receivership in late September. Such an odd place for condos, all your neighbours are industrial or building supply places. That tiny little commercial are on Van Isle way will soon be surrounded by residential buildings. Its a crappy little commercial area and will probbaly be gone one day. Oy Vay. There is another one being built about a block away. Maybe they should put it on hold. 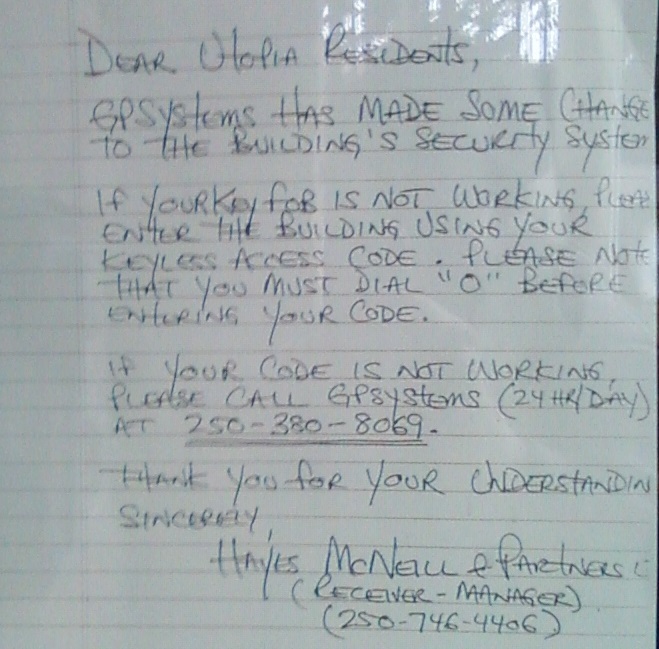 Utopia was in a bit of a different situation that most condo projects. The developer who took over the previously failed project had no experience with a development of this scale and complexity. It was a steep learning curve for her and had the market been in a different place all would have worked out eventually. What could happen to owners who have purchased and are living in Condos if the owner or developer of the unsold ones goes into receivership like it is now. What scenarios could play out for those owners. In the short term I would expect that the reciever will "keep the lights on" and make sure that everything that needs to be done in and around the building will be taken care of. They would be charged by the courts with maintaining the value of the building as a whole. I would expect that the receiver will determine the value of the individual units by way of independant appraisers and then sell them off. By law they are only charged with getting "fair market value" and that will be the question. What are the values in that building in todays market? I would expect that they will be valued far less than what people originally paid and that is the rub for anyone who has bought in there already.